BC Technical services eight CT scanners across multiple facilities for St. Joseph’s Imaging Associates, a radiology group in central New York. According to Lauren Bellotti, Director of Radiology at St. Joseph’s, the relationship is built on exceptional service and outstanding communication. “I could not get this level of service from an OEM,” she says. 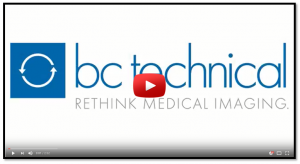 St. Joseph’s Imaging Associates started working with BC Technical in January 2015, when BC Technical acquired Virtual Medical Sales. As a longtime partner with Virtual Medical, St. Joseph’s had experience working with a third-party service provider. But they were impressed with the smooth transition from Virtual Medical to BC Technical. “It was like nothing happened,” Bellotti says. “It was very seamless and we had no issues.” -Lauren Bellotti, Director of Radiology at St. Joseph’s with David Arthur, Regional Service Manager at BC Technical. She praises David Arthur, Regional Service Manager, as a key reason for the successful partnership. She can call him directly at any time – without dialing a corporate hotline or waiting on hold – which makes all the difference. With dozens of scanners across eight locations, keeping units up and running can be difficult. Recently, three units in multiple facilities went down within two days. But Bellotti says that BC Technical was up for the challenge. SUPPORTS EQUIPMENT AND FINANCIAL GOALS. Bellotti says that working with BC Technical has supported St. Joseph’s equipment needs and financial goals, without sacrificing service quality. Bellotti says she has recommended BC Technical to her colleagues. “Give it a try, you won’t be disappointed. It’s as simple as that.” She also credits BC Technical as a key element to serving their communities and patients. “It’s been nothing but a great experience,” she says.